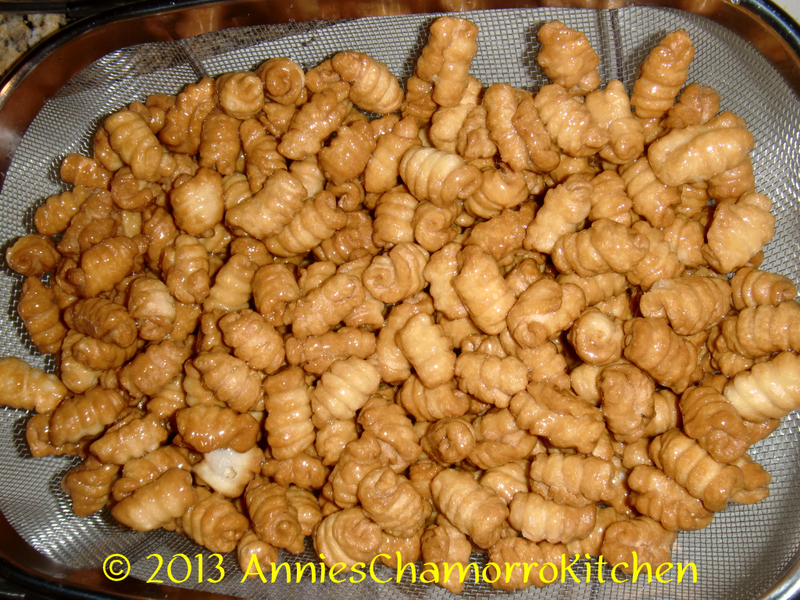 Guyuria (pronounced gu-ju-ree-ah) is another traditional Chamorro cookie (Rosketti is another). Some of my friends call them jawbreakers because of their rock-hard texture. This cookie is not baked, however, it is DEEP FRIED and glazed in a thick sugar syrup that hardens when dry. These cookies keep for a long time, if stored properly. Keep them sealed in a ziplock bag or a resealable container. 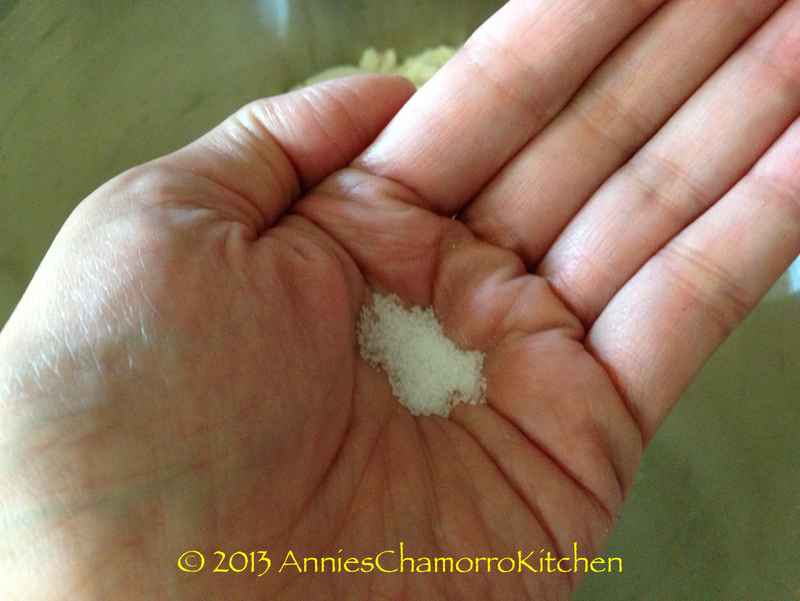 My recipe can be easily doubled, but since they are so easy to make, you don’t have to. Just make up a fresh batch every time the craving hits you–which will be often, once you try these cookies. Trust me. Fry up a batch today. You’ll be glad you did. 1. 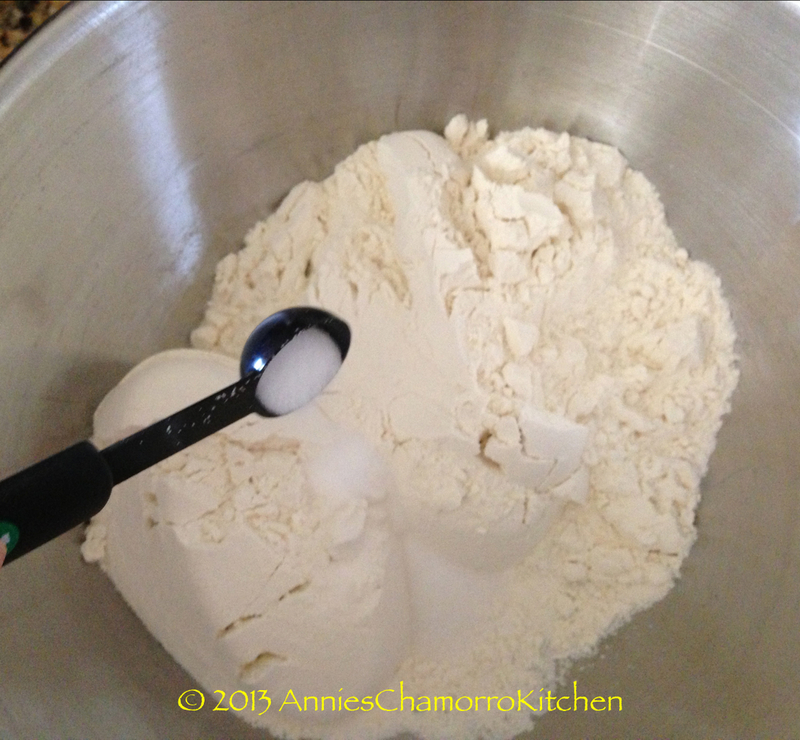 Make the dough: Mix the flour, salt, and teaspoon of sugar together. 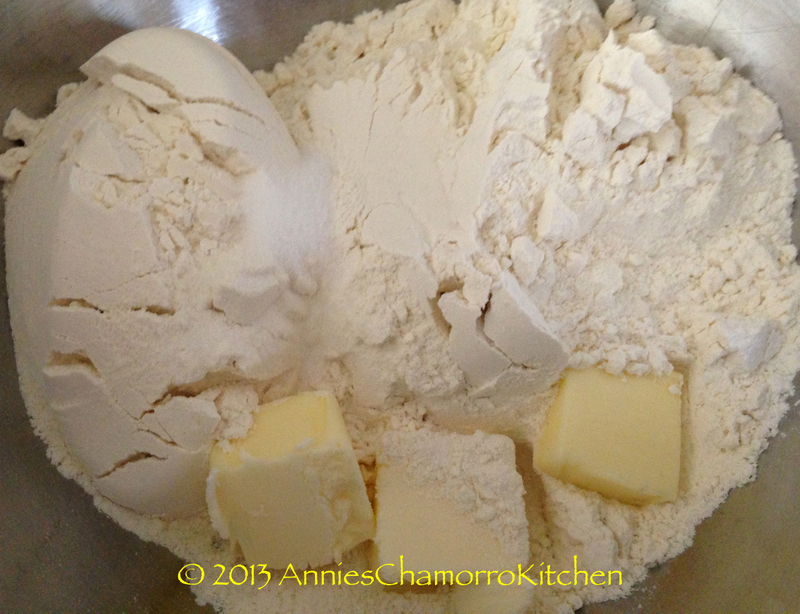 Cut the butter into the flour mixture (as if you are making pie dough). 2. 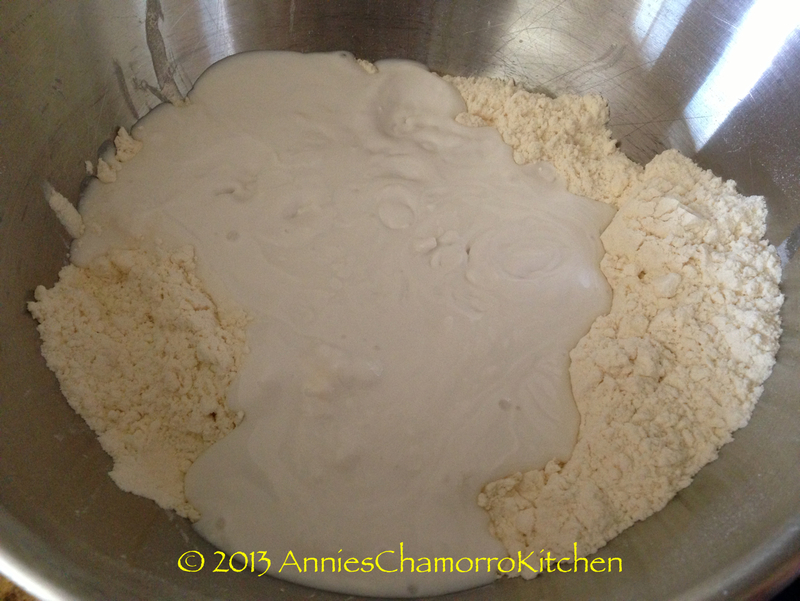 Add in the coconut milk and knead until a dough forms. 3. 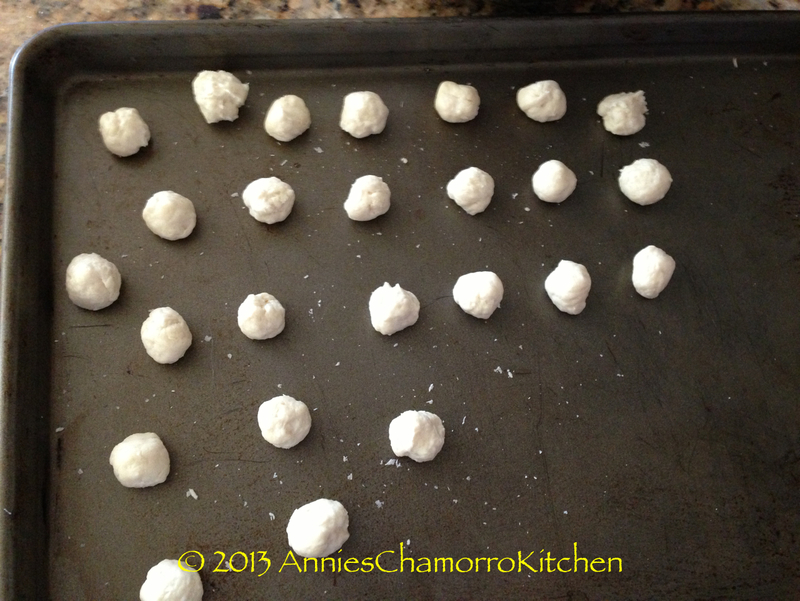 Roll the cookies: Pinch off small pieces of dough, the size of a small marble. 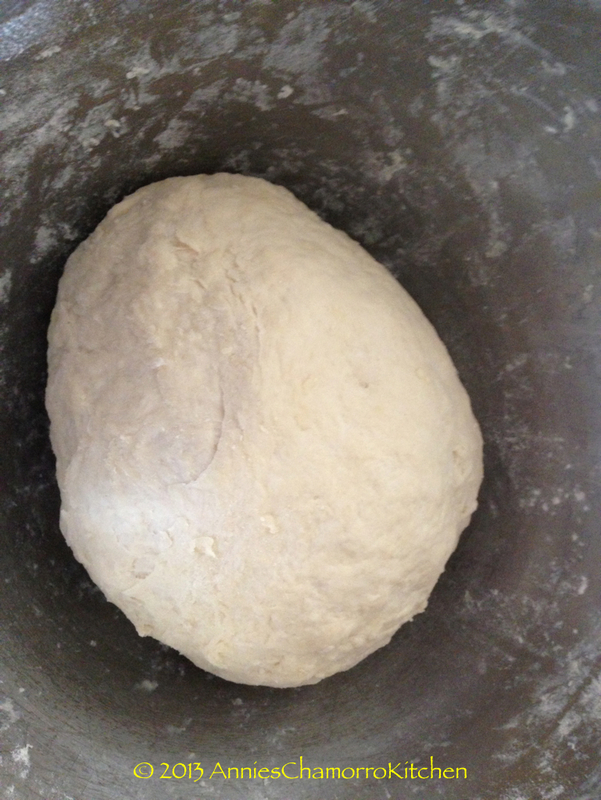 Press the dough onto the back of a fork; slowly roll it off the fork, shaping it into the traditional guyuria shape. 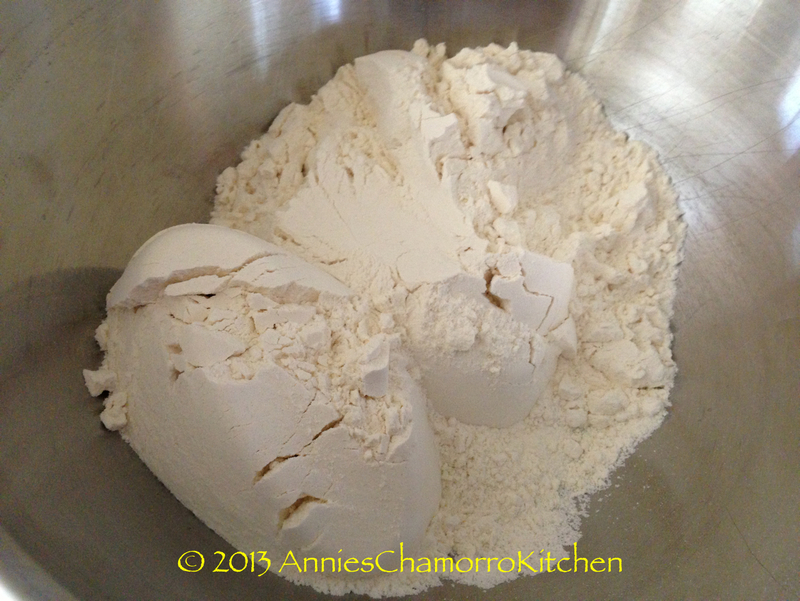 OR: roll out the dough and cut into small pieces. 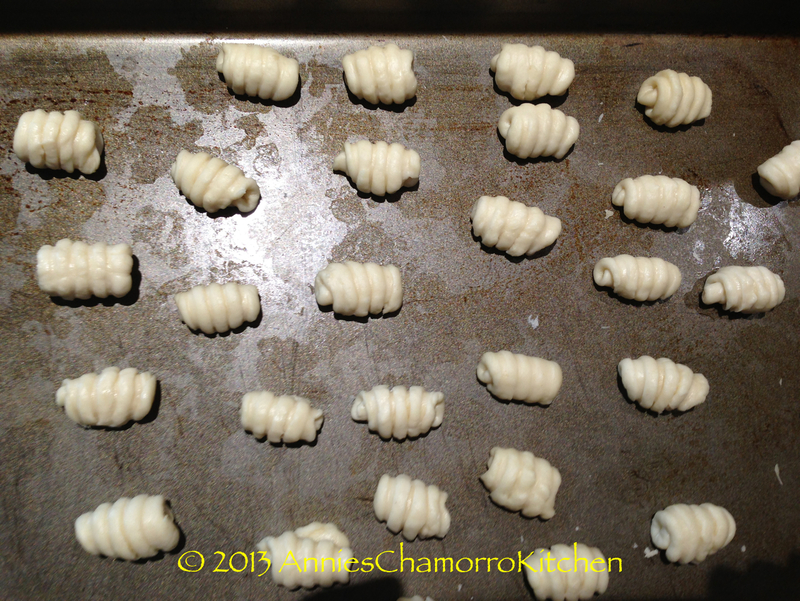 Set the formed cookies aside for a few minutes to dry slightly. I find this helps when frying the cookies. 4. Heat the oil to about 350 degrees. Here is a tip on how you can tell if the oil is hot enough. 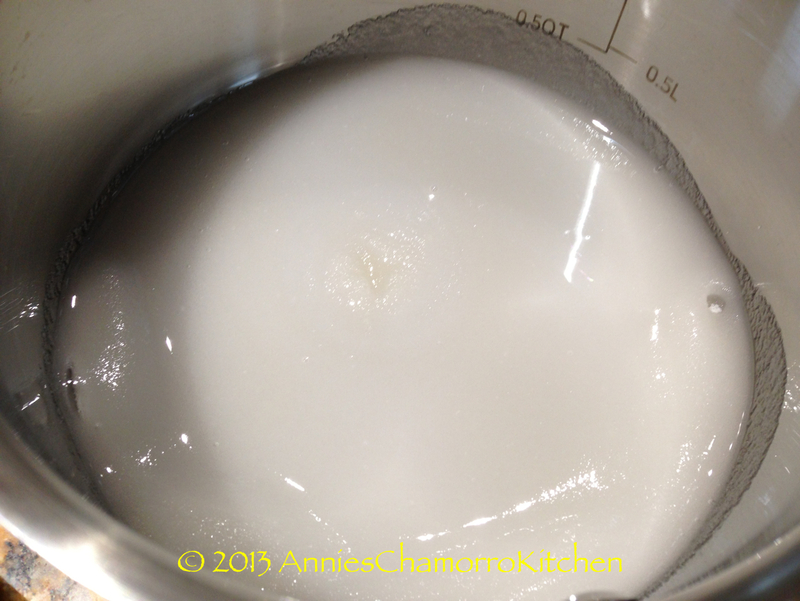 Dip the tip of a wooden spoon (I use a wooden chopstick) into the oil. 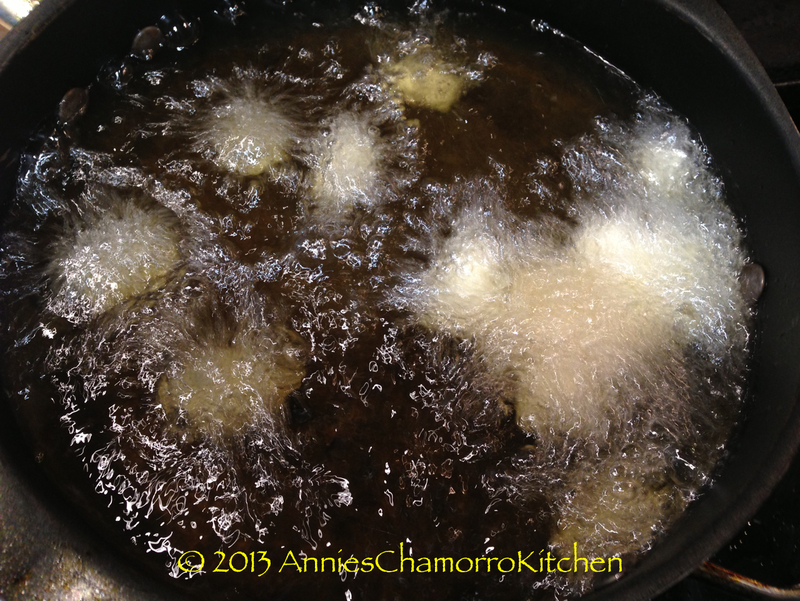 If little bubbles start to form around the wood, then the oil is hot and ready. Make sure the wood is clean and dry first; you don’t want hot oil to splatter and burn you. This is a short video clip I made that describes what I stated above. You can see all of the little bubbles form around the tip of the wooden chopstick. This tells you that the oil is hot and ready for frying. 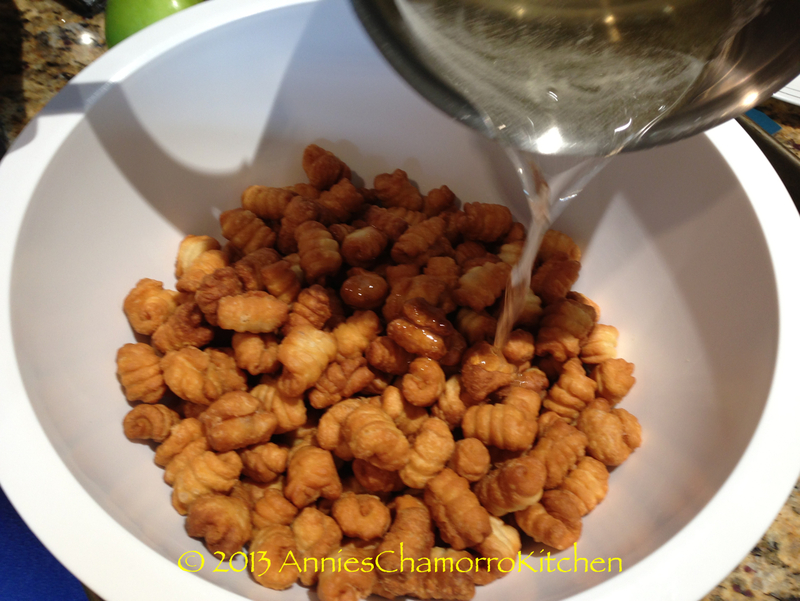 Fry the cookies until golden brown; drain well on paper towels or in a colander. 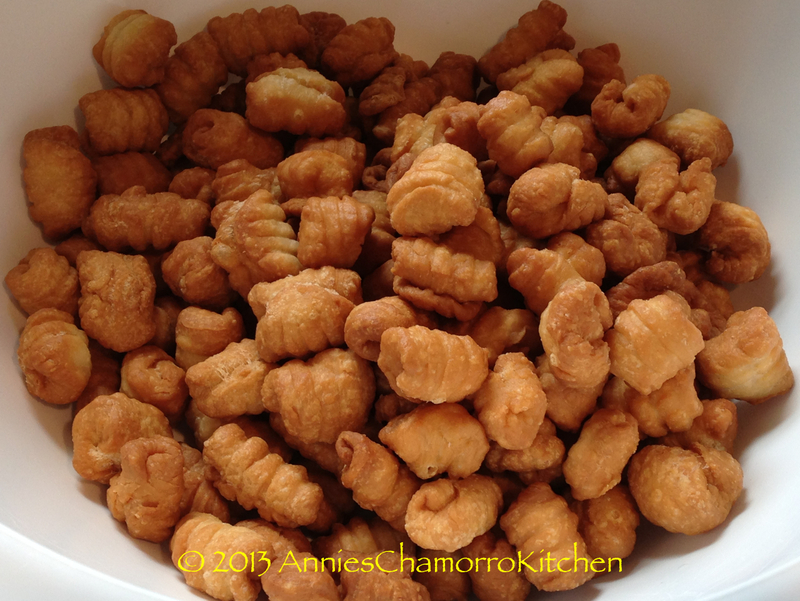 For crispier cookies, fry until the cookies are a dark golden brown. 5. 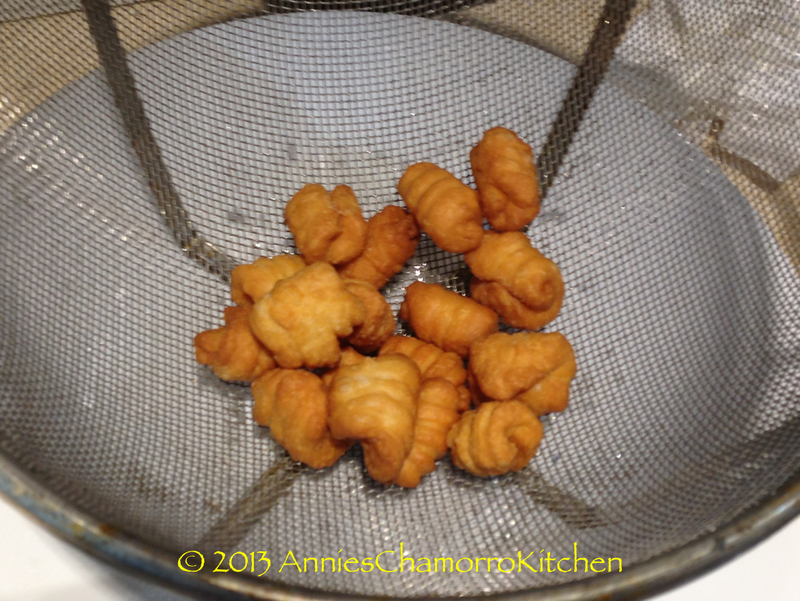 When all the guyuria is fried and cooled slightly, place them in a large bowl. 6. 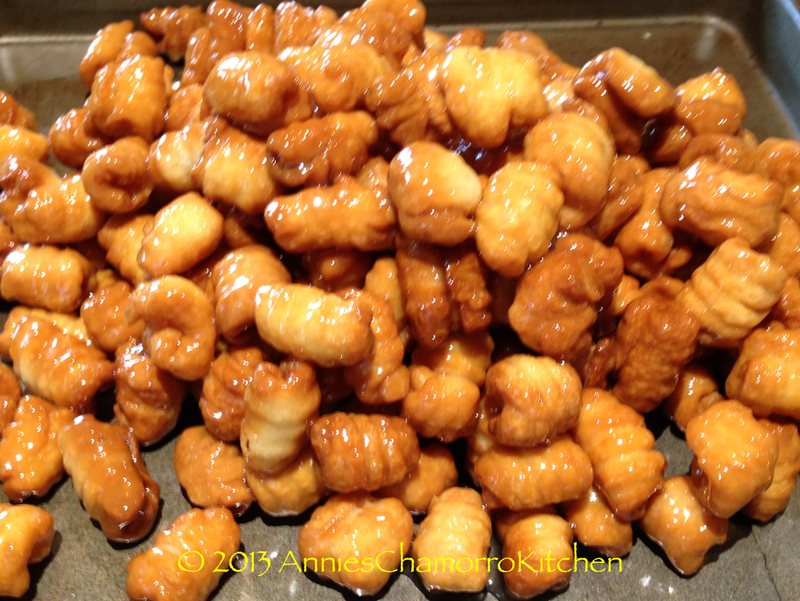 Prepare the sugar syrup glaze. Place the cup of sugar in a small sauce pan. Add the water to the sugar. 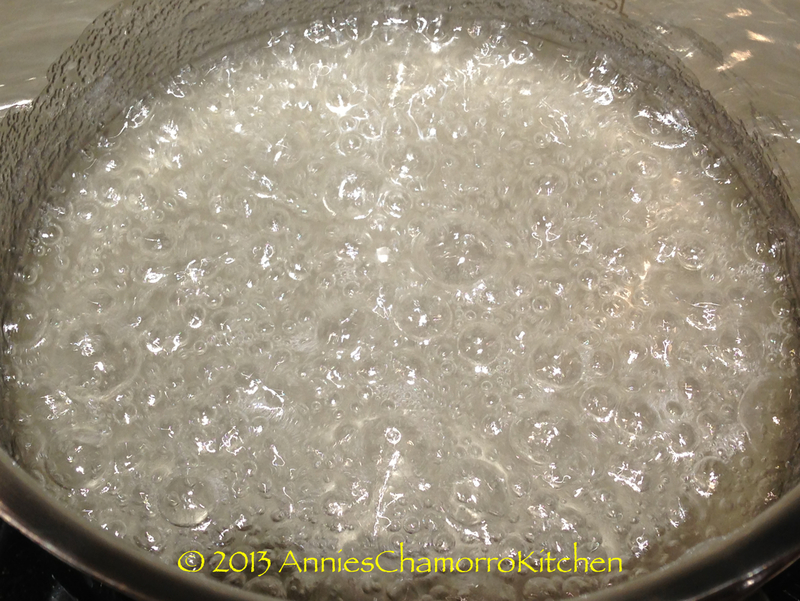 Bring the mixture to a boil, stirring constantly until the sugar dissolves and a syrup forms. 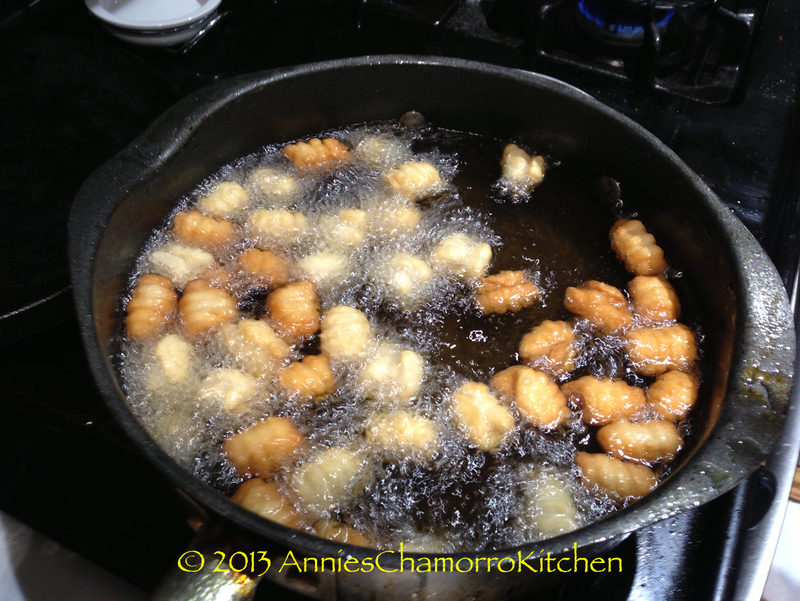 Remove syrup from the heat; allow to cool to thicken slightly. 7. 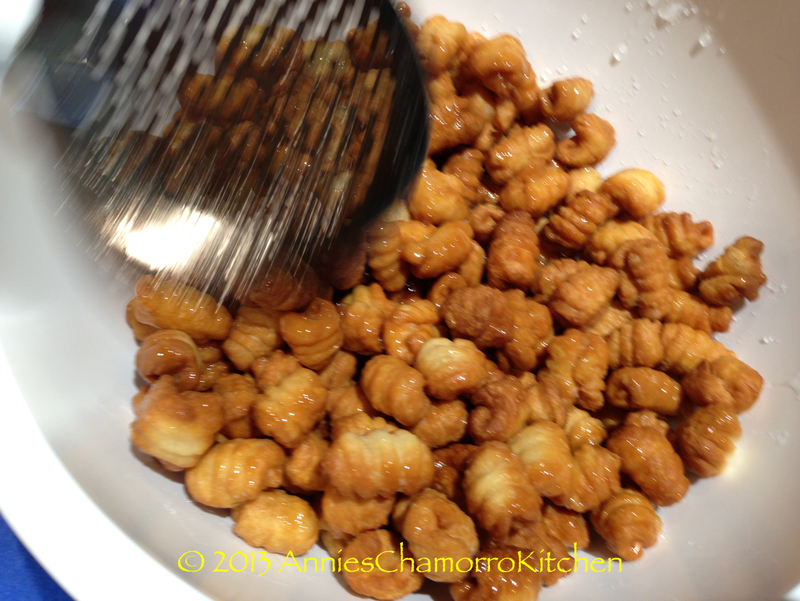 Pour the sugar syrup over the guyuria, tossing gently to coat all the cookies. 8. 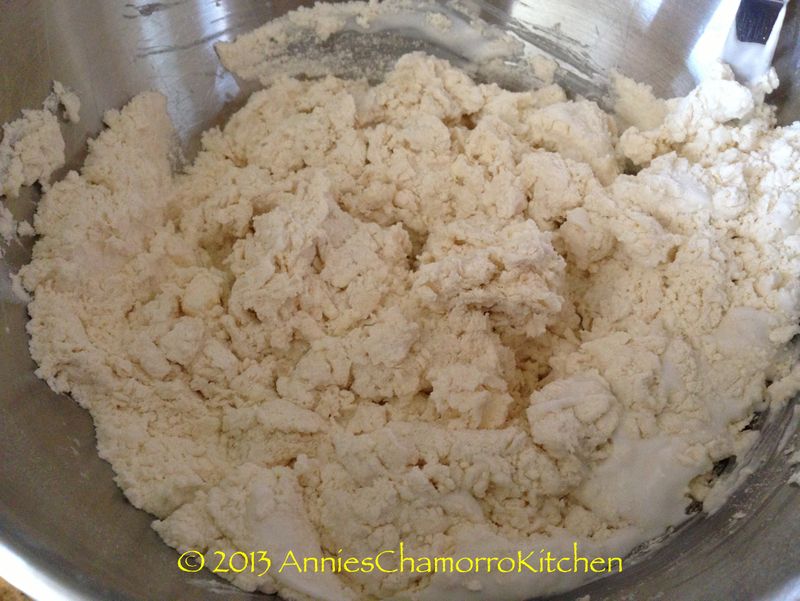 Let the sugar syrup thicken then pour out the cookies onto a baking pan (pour any excess syrup over the cookies). Spread the cookies out in an even layer; let them sit for a few minutes to allow the glaze to harden. 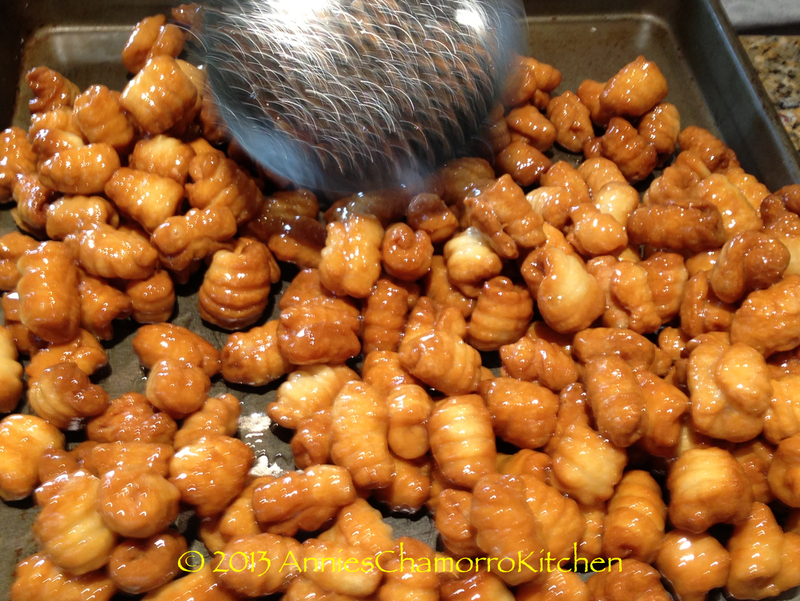 Ensure the glaze is completely dry and hard before storing the guyuria in a ziplock bag or resealable container.